ATKINSON - SWINDON, THIS IS SWINDON. Shown here is a white Ginger Beer and a damaged 10oz Codd. ​C.C. 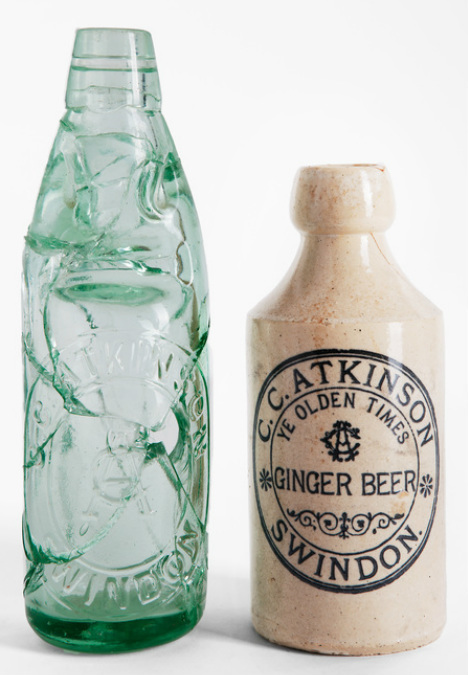 Atkinson was first listed as an aerated water manufacturer in 1901 and were located in Cromby Street, Swindon. C.C. Atkinson was born in 1870 in Surbiton, Surrey. His father was a Manufacturing Chemist. 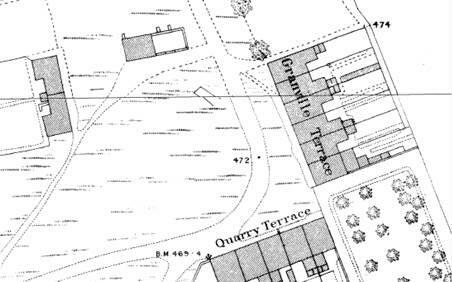 In the 1901 census he is living in Whatley, Somerset with his wife and parents. His occupation is Mineral Water Manufacturer. According to an advert in the Swindon Evening Advertiser, May 1902 saw Frank Williams buy the mineral water business of both Harry's Stores and C.C. Atkinson of Cromby Street. He died on the 2nd Sept 1908 aged just 38. 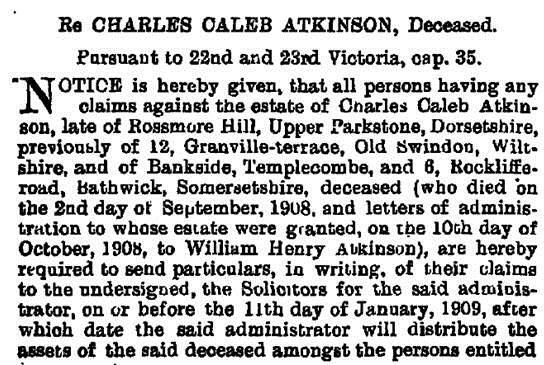 Public notification of his death in the London Gazette confirms his link to Swindon as it lists him as having previously lived at 12 Granville Terrace (now Quarry Road), Old Swindon.